I say 'cooking with kids', but Sophia very proudly rustled up these flapjacks on her own the other day, the only help I gave was moving the hot saucepan and getting the pan out of the oven. She even took this photo! 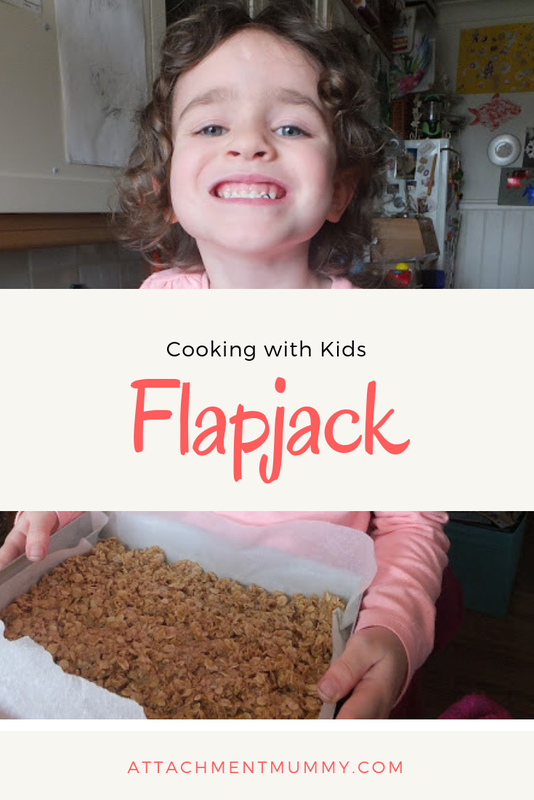 Flapjack is one of those rite of passage bakes on the way to becoming a cook, so the 5 year old definitely has a head start. Bookmark the page and bake some with your kids this weekend. 1. Grease and line a brownie pan, traybake tin or roasting tray. Pre-heat oven to 160C. 2. Melt the butter and sugar in a heavy-bottomed saucepan over a low heat. Stir until dissolved, then stir the golden syrup in. 4. Press the oat mix into the prepared tin. Bake for 30-35 minutes until firmed and golden. Once the flapjack has cooled, melt 150g chocolate in a bowl over hot water. Dip one half of each flapjack slice into the chocolate then leave to set. Ahh! We haven't made flapjacks for ages! How lovely. Weekly baking is such a pleasure.